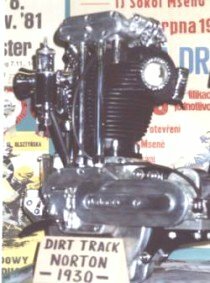 This machine was designed and manufactured by a firm whose renowned road-racing products had been successful in almost every event entered, was sure to interest all dirt-track enthusiasts. Since its introduction, it captured many track records in Australia and New Zealand, and was popular on English tracks. The engine, which had a bore and stroke of 79x100mm. giving a capacity of 490cc, although in general lay-out was very similar to the standard engines, it was an individual production specially tuned and bench-tested. It was absolutely vibrationless at all speeds, even with the high-compression (C.R.10.5 to 1) aluminium-alloy piston fitted for use with R.D.I fuel. A spare piston, complete with Wellworthy rings (standard on Norton engines), was supplied for running on petrol-benzole. The double-row roller big-end bearing, the mainshaft bearings and the totally enclosed valve gear were all efficiently lubricated by an externally situated Best & Lloyd mechanical pump, driven off the inlet camshaft. In addition to this pump, there was an auxiliary hand pump. The neat enclosure of the push rods and overhead valve gear, together with the provision of a large shield in front of the chain-driven magneto, gave all the cinder exclusion desirable. The carburetter was a double-float-chamber Amal, with spare jets suitable for petrol-benzole fuel. It had quick-action twist-grip throttle control, and a magneto cut-out was provided. The magneto itself was a racing-type Lucas. Features in the Norton specification included the following : A powerful frame of 30 per cent carbon steel, with the angle of every lug and tube carefully calculated so as to resist all possible stresses likely to be incurred ; parallel forks of special design, with no links and with Andre steering damper, a countershaft gear with hand-controlled clutch, giving with a 6o-tooth rear sprocket and a I7-tooth engine sprocket a standard gear ratio of 8 : 1, with alternative ratios of 8, 8 and 9.2, using 18- and 16-tooth engine sprockets respectively; chromium-plated pressed-steel front-chain cover; special cushion-top saddle and knee hook. The knee hook, as on the other dirt-track machines, was adjustable in both a vertical and horizontal direction. The following two photographs supplied courtesy of Richard Snodin that he took at the 1999 BMF Rally.